I was just checking out the Zazzle blog and came across this photo a customer sent in. What a fun idea for someone planning a baby shower and looking for an inexpensive way to put some party favors together. Since the blog doesn't cover how the customer put this together, I figured I'd make my own little guide for people who might be looking to do the same thing. First thing you need are some basic tin mint boxes. I'm sure you can find them at a local party supply shop or dollar store, but I've also found them on Amazon. You can buy 1 for 67 cents (not sure why you would just buy 1 box, maybe to see a sample) and the smallest quantity after that is 50 boxes for $28.77, which is about 57 cents a box. 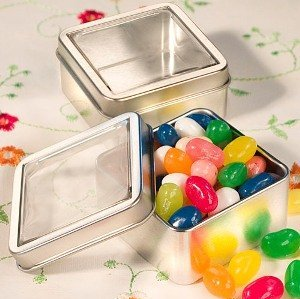 The next thing you need to do is buy some candies to fill the tins with. You can keep it simple and fill it with mints, but I love the use of multi colored M&Ms in the beginning photo. The photo shows red, white and pink M&Ms. You can buy these by the pound (and smaller or bigger sizes) on Amazon. but you don't have to use this particular sticker. 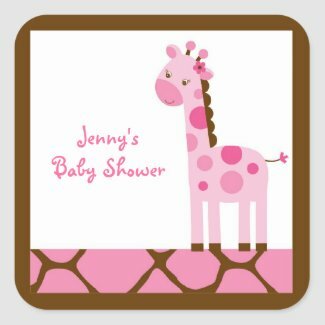 There are thousands of baby shower stickers in the marketplace with many different themes and shapes to fit your needs. Definitely. :) Thanks for stopping by! Great idea. This would be a great way to give coworkers a holiday treat too.